‘Kerala’ is a more emotion when you talk to anyone from the state. The pride, the boldness and the willingness to show no fear (even when wrong) can only be found with the “Mallus”. The state has proven ideal results, particularly with their literacy rate in a populous nation. I remember, back in the early 2000s, when we got our first computer with a dial-up internet connection, I used to keep rechecking the facts in google, just because I didn’t want my home state to have competition. A typical reaction as a kid in a small town, playing in the streets,with the ego that was popped out because of conversations about the neighbour state. The kid in maturity indeed! The book, like the other three, shattered the glass in the mind. Oh! How silly, when others competed with the Mallus forgetting to grow with fellow Indians. I took my time with this book as I did not want to miss every story and genres of flavours the book was stitched with. I, in-fact took notes on a piece of paper to make sure my squirrel brain does not forget the most important things about this vibrant state. 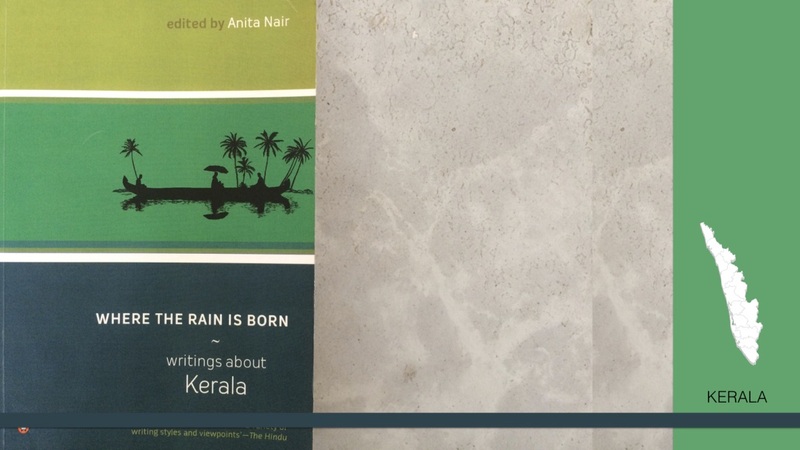 Where the rain is born is a compilation of the best of the best about the state. You can find authors from all over the world, touching and feeling the roots the same way. What kept me with this book for every page was that it spoke about geography, culture, history, people, values, traditions and most importantly, nature. I have had some fortunate instances in my past to tour this state and all I could see was it being carpeted by greenery. However, the book revealed that there is another face, a face that is dying and fading because of modern times. A state, left to the western ghats and in its political views as well has been unique ever since inception. The Matrilineal society is one clear example. Open mindedness to be unique when your ecosystem is not, is bravery showcased indeed. You have a state that faces the wrath of the south-west monsoon every year and that holds dear Vamana, Parasurama and St Thomas. This is what brought the Europeans! Such is a state where vibrancy has been prevalent which lead me to a MAK TIP! With your current standing in this society, do you think you have what it takes to deliver the knock-out punch? For one to have the ability is to be vibrant in what he/she is and what he/she does. Notice people who have the knock out punch and check their vibrancy. They may have a narrow focus and a goal, but not with vibrancy in nature, vibrancy in the ecosystem, vibrancy in the intellect. Vibrancy is the punching knuckles you need when you give the knockout blow!